Round and Round It Went! Combine all the ingredients for the marinade and mix well. Massage into the leg of lamb and allow to marinate for 24-48 hours in the fridge. Preheat your barbecue to 300º C (575º F). 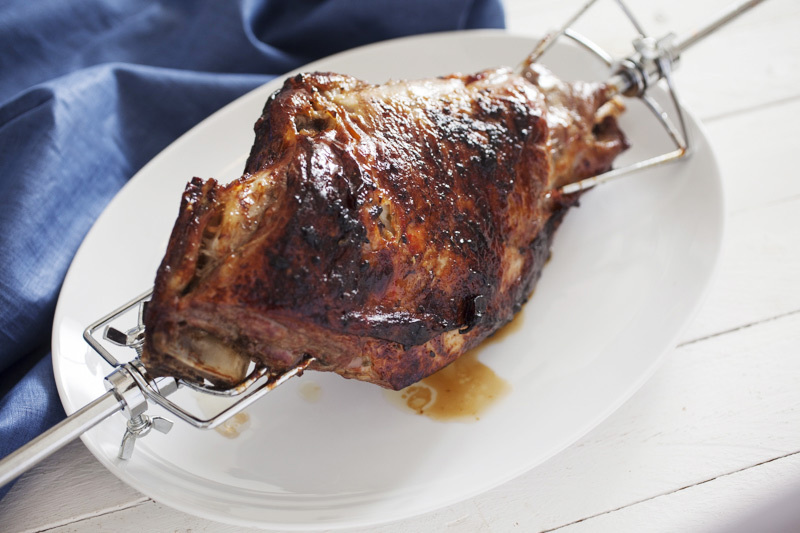 Following the directions, assemble the rotisserie and center the leg of lamb over the grill. Place a tray under the lamb on the grill. Do not use the burners directly under the lamb, use indirect heat from the side burners and the back burner if your BBQ comes equipped with one. Lower heat to 200º C (390º F) and cook for one and a half to two hours basting every 15 minutes with the marinade. When done, remove the lamb from the barbie and cover with foil and a towel. Allow to rest for 15 minutes before carving.